Fig. 1. Spray solutions "Automax" type of JSC-2: 1 - reservoir; 2 - piston pump; 3 - autoventil; 4 - trigger; 5 - pipe; 6 - injector; 7 - pressure hose. Fig. 2. Spray solutions like "Desintall". Fig. 3. Aerosol insecticide spray. Fig. 5. Installing the sprayer MRF-2 on the scooter: 1 - sprayer; 2 - a tank for liquid disinfectant. Fig. 6. Combined disinfection equipment type KDU: 1 - sprayer; 2 - pollinator. Fig. 7. 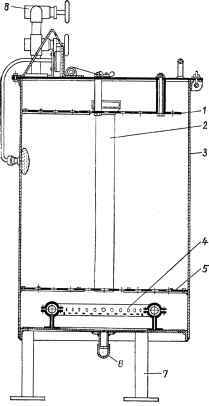 Steam metal Budilnik: 1 - upper plate; 2 - circulation pipe; 3 - tank; 4 - bubble pipe; 5 - the lower the bottom; 6 - valve; 7 - hour, 8 - comb. Disinfection devices - devices for spraying disinfectants (solutions, powders, and various devices (buzilniki, mechanical means and others)used for disinfection and disinsection. The main components of many of disinfection devices are: the tank, pump, nozzle. There are disinfecting vehicles with manual and mechanical drives. When disinfection of premises used sprayers solutions "Automax" type of JSC-2 (Fig. 1), hydropulse and Desintall" (Fig. 2). "Automax" and "Desintall" on the device and the operating principle is similar, only differ in shape and size. Under the pressure of the air is pumped into the tank, the liquid passes through the injector is sprayed. Spraying solutions insecticides also produce aerosol cylinders (Fig. 3) vapour pressure evaporation mixture of freons. 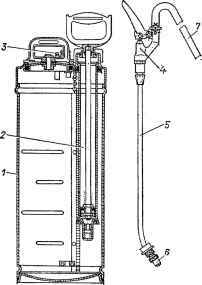 For disinfection apparatus with mechanical drive is a low-pressure sprayer RND-P (Fig. 4). 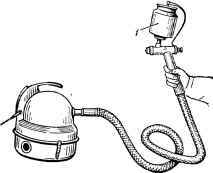 The air pumped vacuum cleaner, captures the liquid, and through the jet and guide cap it comes out in the form of fine torch. Fig. 4. The low-pressure sprayer RND-P with drive cleaner: 1 - spray. Large rooms and grounds are processed using the sprayer type MRF-2. The sprayer is the internal combustion engine and gear pump. Sprayer MRF-2 and disinfection combined installation KDU are driven by an engine type, power saw, and car - mounted NAO-2 - the engine of GAZ-51 or GAZ-63. The sprayers are equipped with needle injectors. MRF-2 is mounted on the truck scooter (Fig. 5). KDU - set, combining sprayer and the pollinator. The motor shaft alternately connects hydraulic cylinder pump with a comb or with a device to spray powders - fan nozzles. In the first case works sprayer, in the second - pollinator. Mounted on a motorcycle (Fig. 6). After using disinfection apparatus shall be washed with clean water through the spray device. At breaks in work more than 1-2 days AIDS grease with a mineral oil. At least twice a month cuff pistons also recommended to lubricate. Keep disinfection devices in a dry heated area. For air disinfection in infectious hospitals, operating and other recommended ultraviolet irradiation lamps of the PDR or mercury-quartz lamps of a high pressure. Lamp equipped with canopies to protect eyes and skin from exposure. As a rule, the exposure of premises should be done in the absence of people. 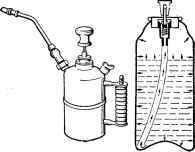 For Bucine infected linen boiling soap-soda solution apply disinfection steam buzilniki (Fig. 7). Budilnik - wooden or metal vessel with two lids open in turn, eliminating simultaneous loading infected and unloading of clean underwear. Warming of the water in buzilniki lasts 30 to 40 minutes Boiling from the moment of boiling of water - 30 minutes In infections, caused by the spore-forming microorganisms, boiling linen is increased to one to two hours. Set buzilniki usually in the doorway of the septum that divides the room into "dirty" and "clean" half. In the dirty half load linen, clean - unload. Mechanical means of extermination of flies: firecrackers, a glass and net flycatchers, which are supplied by different baits. Glass flycatchers set in a residential area, net - on covers of trash cans, garbage pits, etc.